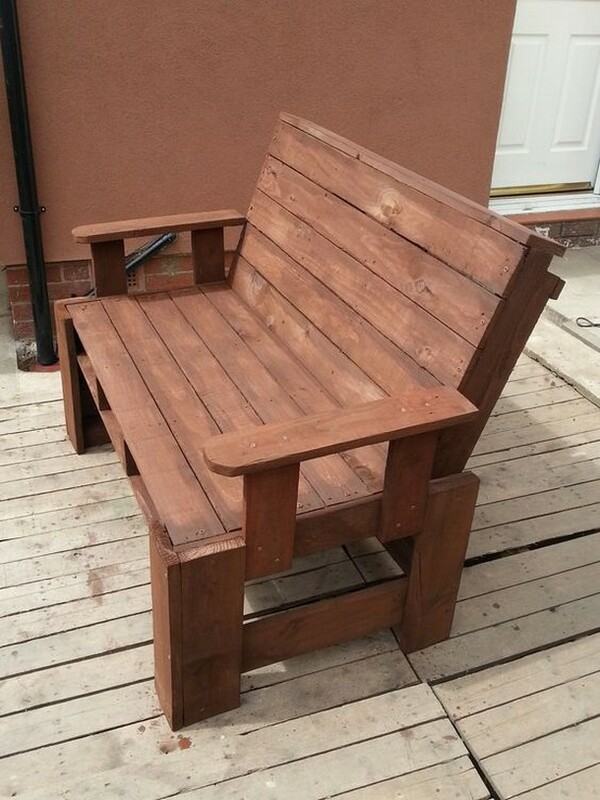 I think the wood pallet recycled furniture offer you a few things that just can’t be achieved from the market oriented wooden furniture items. Other than that this has got so many potential benefits that simply are unmatched. To me this is a passion an obsession that I have been pursuing since years and this has literally transformed my life. 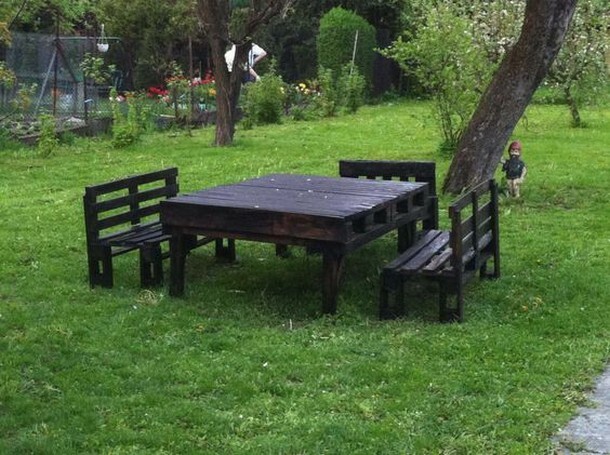 I just grab the basic ideas of the wooden furniture items and then recycle the wooden pallets. Here I have compiled a list of 20 ideas for pallet patio furniture items. 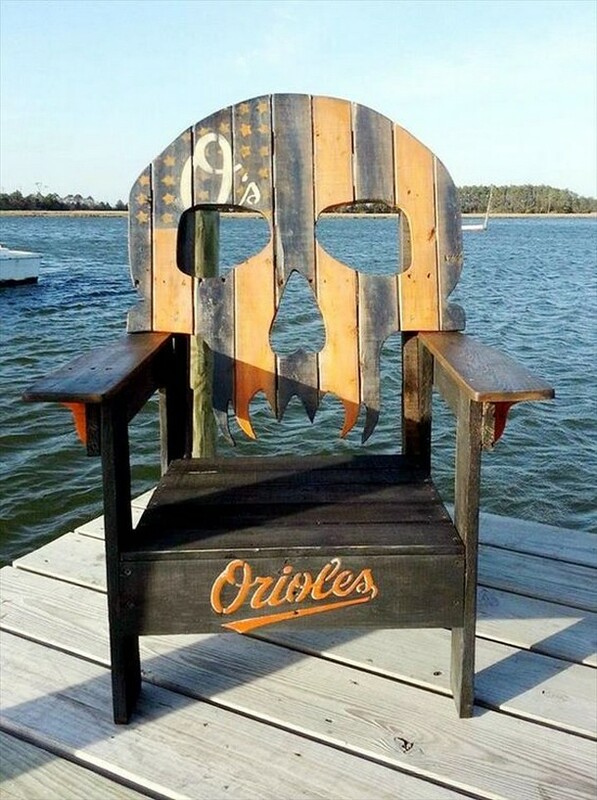 Have a look on them and grab one for your patio. We all are familiar with these wooden barrels. 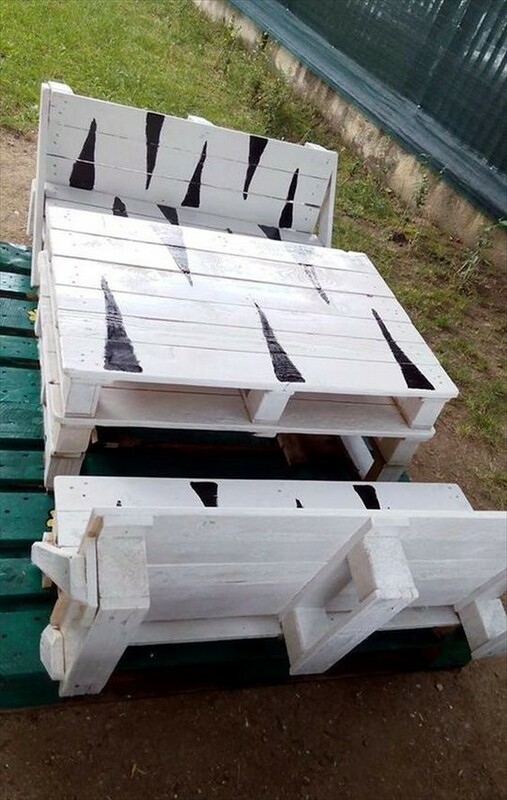 They are used to make wine, but here in our recycling world we have made this wooden item recycled with wood pallet for chilling the beer bottles. 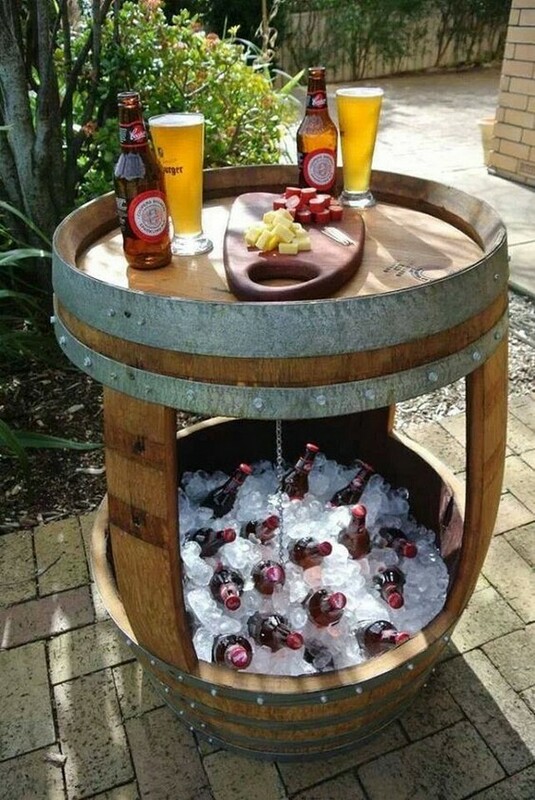 The wood barrel is turned into this beer chiller in a very smart way. Cable reel that is also made with the wood is another major item that we usually use in our wooden creations. 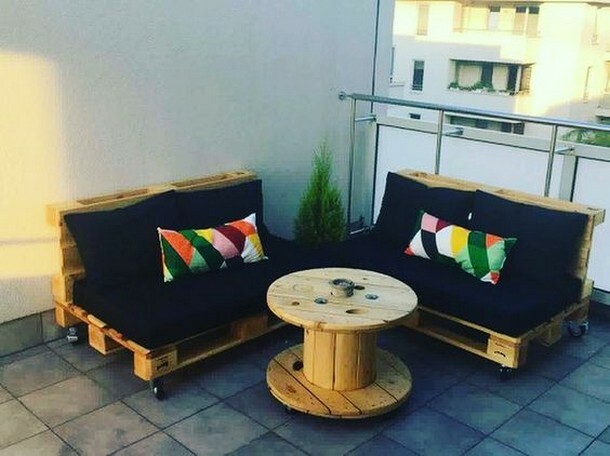 We have recycled a pair of wooden pallet couches here, while the centre table is made using the wooden cable reel that can be arranged very easily from different sites. 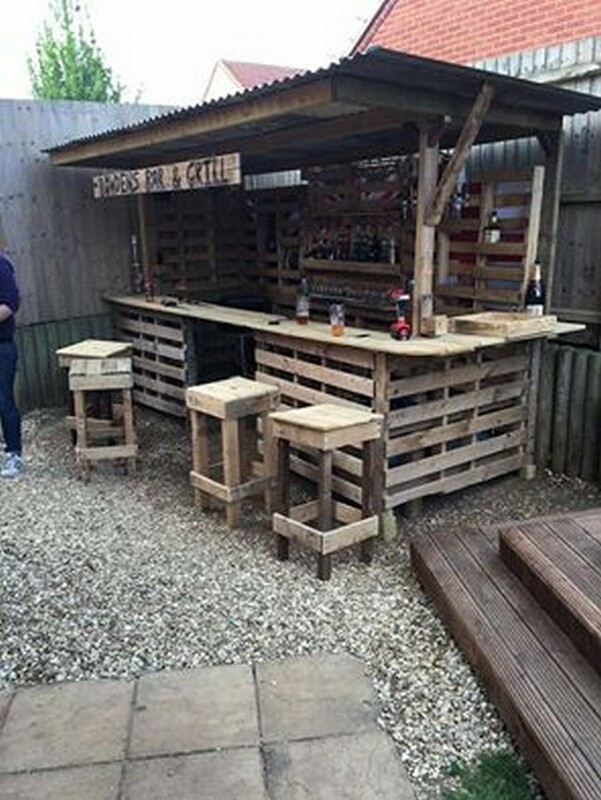 Look at this wooden pallet repurposed patio bar. A whole bunch of pallet wood is used in making this patio bar table. This whole set up took a couple of days but in the end we realized that all the effort put in making this was pretty worth it. 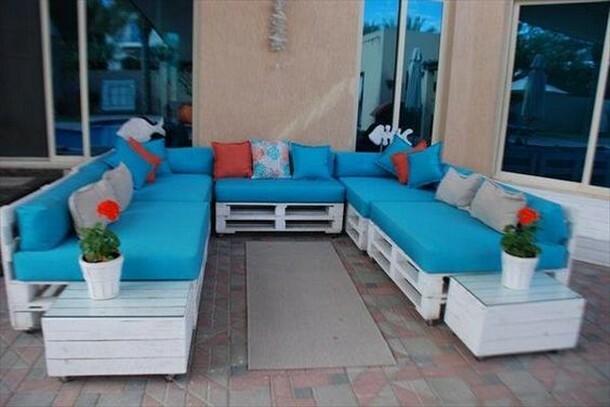 L shape wooden pallet couches are quite famous in our pallet woo creations. We repeatedly use this pattern as this is widely acclaimed by the users. We simply bothered to arrange some very fresh shipping wood pallets. And the matching pallet wooden coffee table is also made using the same pattern. This kind of pallet wood upcycled coffee tables are also another common furniture item that we have made countless times. Juts with some slighter modifications we have made a number of pallet wood coffee tables in many of our pallet wood recycling projects. 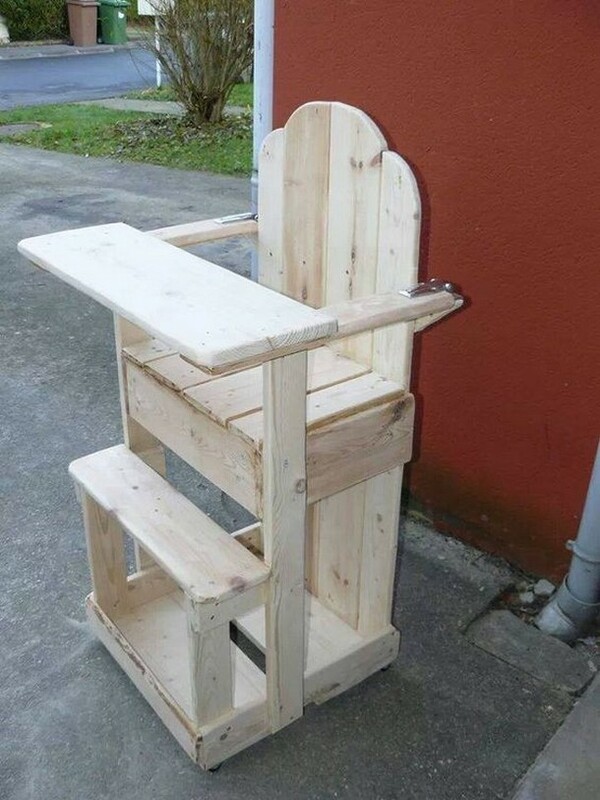 I think all the parents would immediately get attracted towards this pallet wooden recycled toddlers feeding chair. We buy this kind of chairs from the market against hundreds of bucks. But with the wood pallet we just made it so easily using some of the finest shipping pallets that were pretty idle. 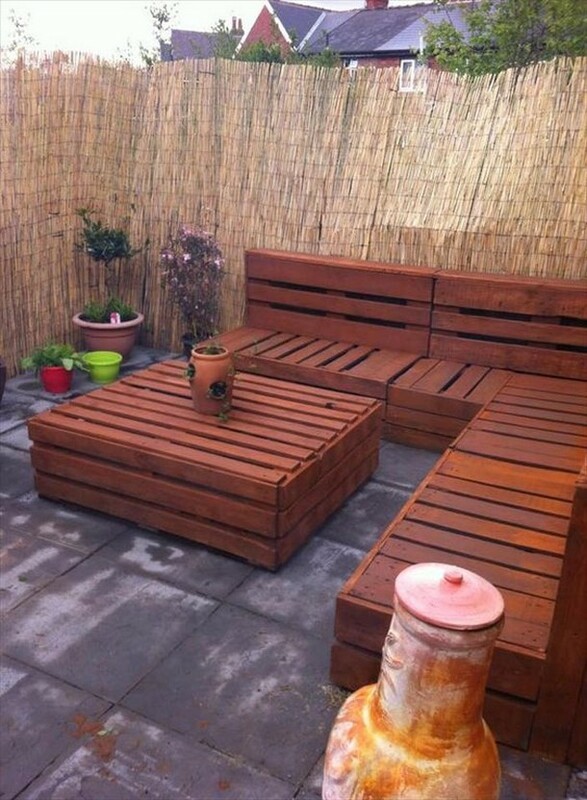 If you have got a huge patio or a green landscape, you must equip it with all necessary wooden furniture items. But if you are going to buy them from the market, be ready to bear a price shock. But if you make it with the pallet wood, just don’t worry about the finances. What did we do here with this wooden pallet furniture range? We just exploited the paint brush strokes and we drew some attractive patterns on the pallet wood benches and the centre table. Rest is all done using the same shipping pallets that are the main theme of our topics. Bench is especially associated with the outdoor spaces. 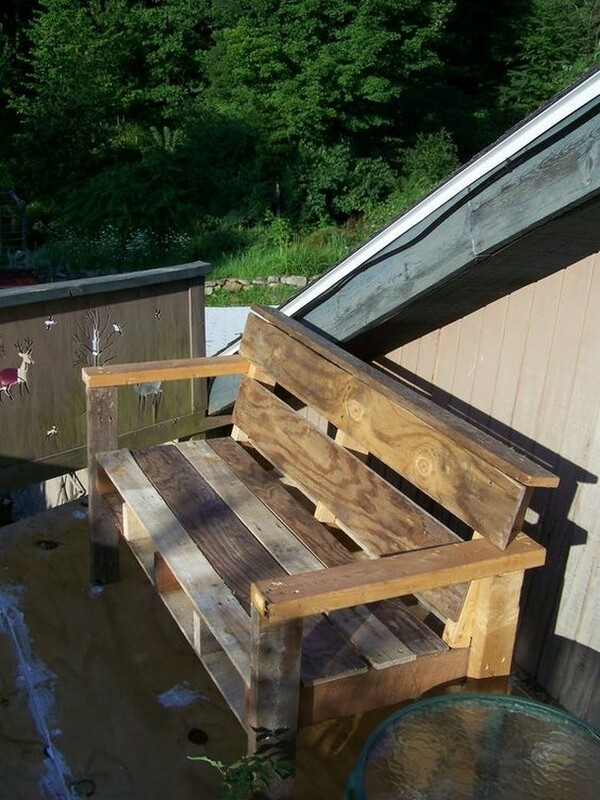 Whenever we think of the garden and the patio, the very first thing that comes to our mind is the wooden pallet bench. 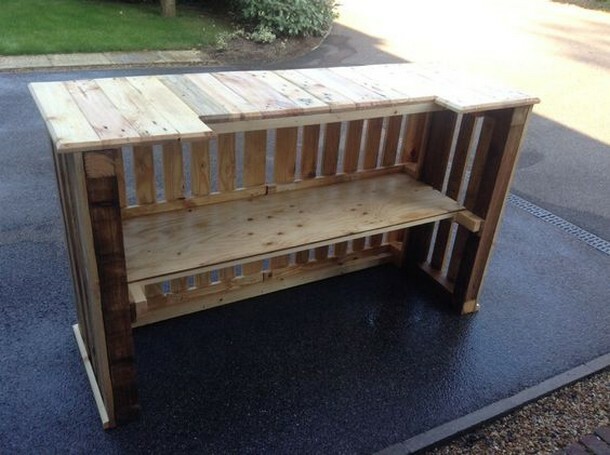 This time we have made this pallet wood bench a bit differently. 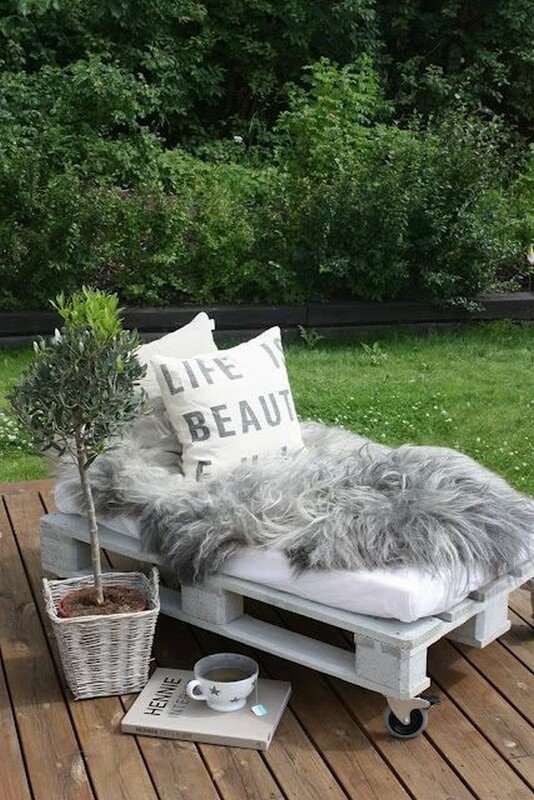 I think you guys want some more pallet wooden benches ideas that are not typically designed. 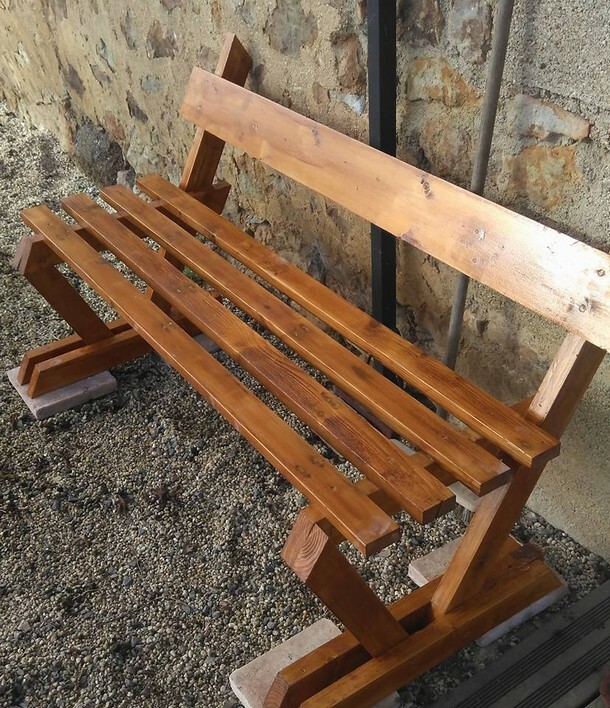 Knowing your lust for different patterns of the pallet wooden benches, here I bring you guys another pallet wood bench that is designed in a perfect manner. This is ideal for a couple of people at one time. 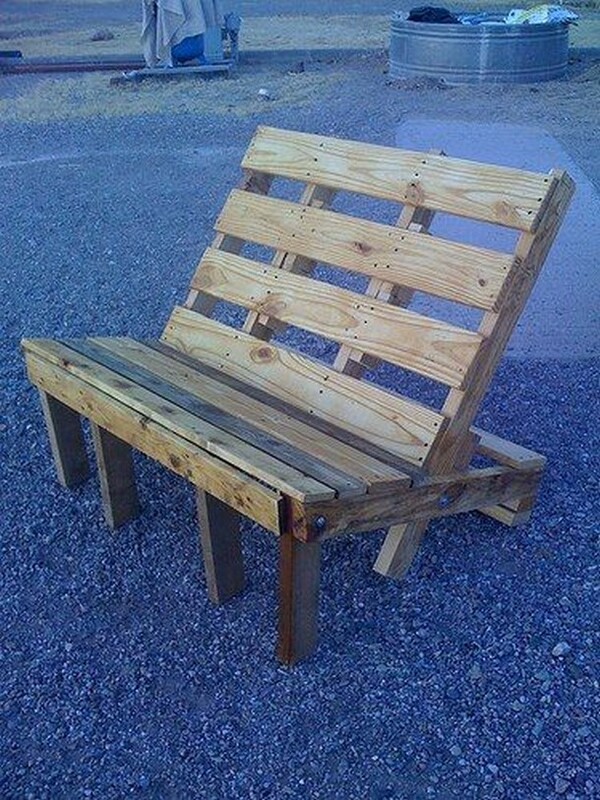 This wood pallet bench made with some broken and deteriorated shipping pallets is another good addition in this distinguished range. We didn’t bother to stain it and we left it upto you, paint it the way you guys like. Sitting space and the comfortable back is pretty supportive. 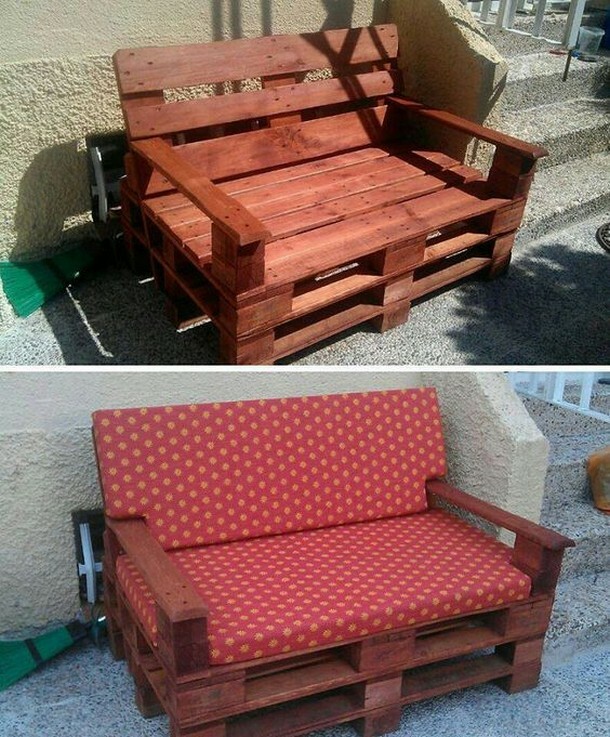 And here comes an elegant pallet wood upcycled couch. This is a bit similar to the wooden benches but just as an exception this is more close to the wooden couch. It has got a spacious sitting space, a wide comfortable back along with a pretty superb and simple design. This bench can ideally be used in the public places as well. It has got a sleek and stylish design that is simply exceptional. 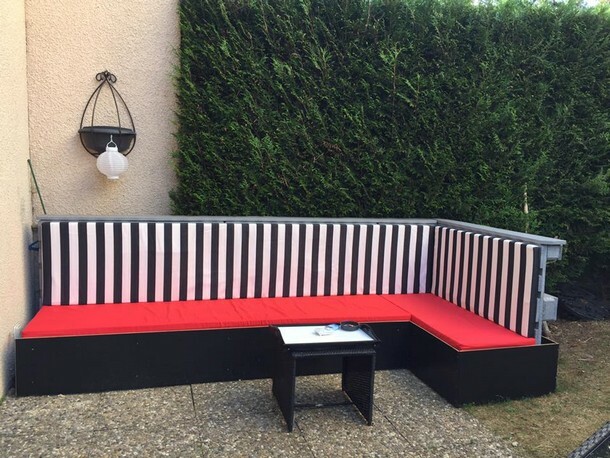 Installing it in the patio you can create a great atmosphere out there. 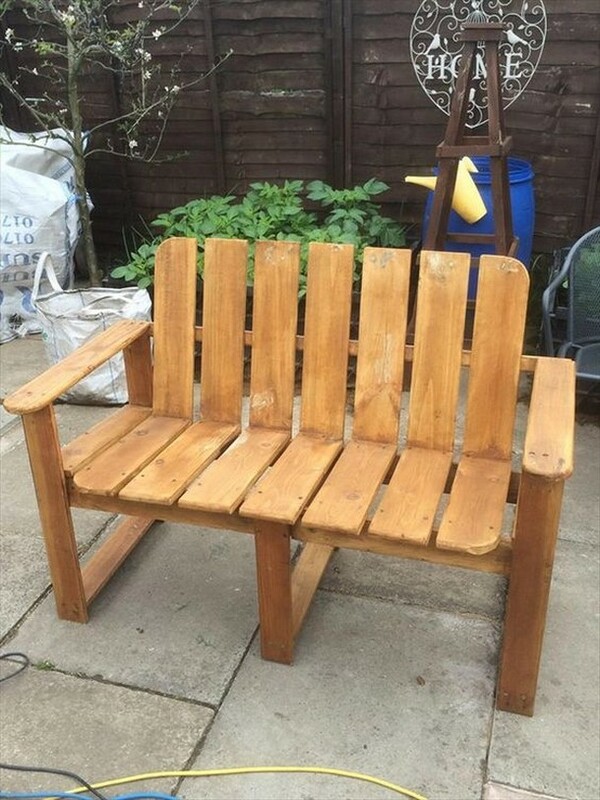 Have a cup of coffee in the open sitting on this pallet wooden bench. Designs, shapes and caricatures look good on the wooden furniture items. Sometimes they are so classic and different that they immediately grab all your attention. Just like this pallet wood chair that can also be ideally used inside the rooms as well. Place it in the patio to have a different experience. 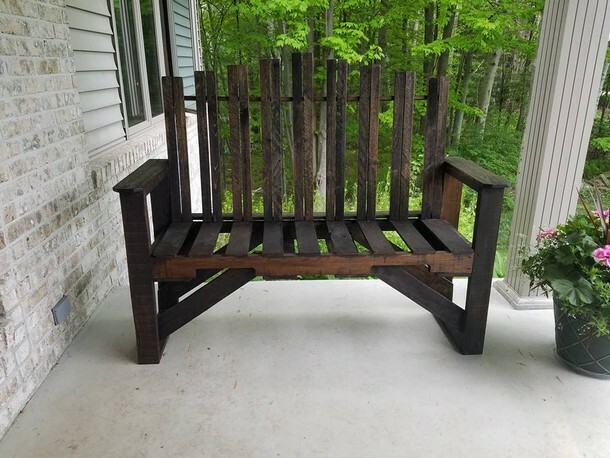 I think this one seems a bit strange, but if you guys ponder on this pallet wood recycled furniture item you must realize that this is inspired from the Adirondack shaped chairs that we have made so many times. This time this is a bit wider. Another grand pallet wooden L shaped couch is brought to you guys here. It seems like this was made for whole of the family. I think more than six persons can easily sit on this at the same time. In making the back of this pallet wood couch, we used some whole shipping pallets. This whole tremendous furniture set up is again made with the same stuff that was quite useless unless we didn’t start recycling it. And this really shows that how great the pallet wood furniture projects might get, like this isn’t lesser in any aspect from the market oriented wooden furniture items. 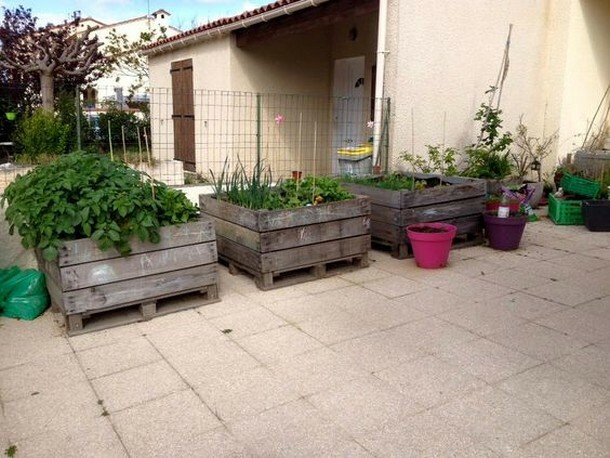 Finally we thought that there might be some guys who are willing to get a smart pallet wood planter idea, so we just thought to bring these gigantic pallet wood planters made with the broken and raw shipping pallets. They would make your patio a better place.